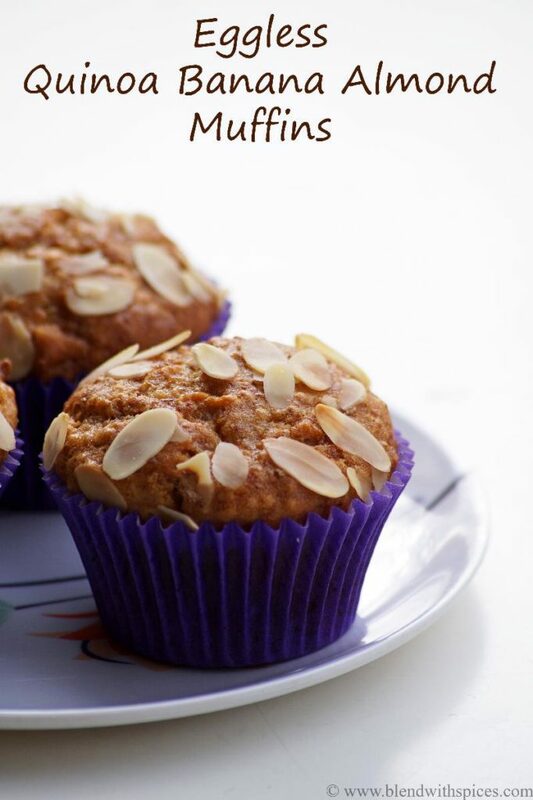 If you are looking for more eggless baking recipes then do check Wheat Banana Choco Chip Muffins, Chocolate Cooker Cake, Strawberry Lamingtons, Wheat Oat Almond Cookies and Eggless Mango Tutti Frutti Cake. Rinse and cook the quinoa with one cup of water until soft. Do not overcook the quinoa. It should not be mushy. Let it cool completely. 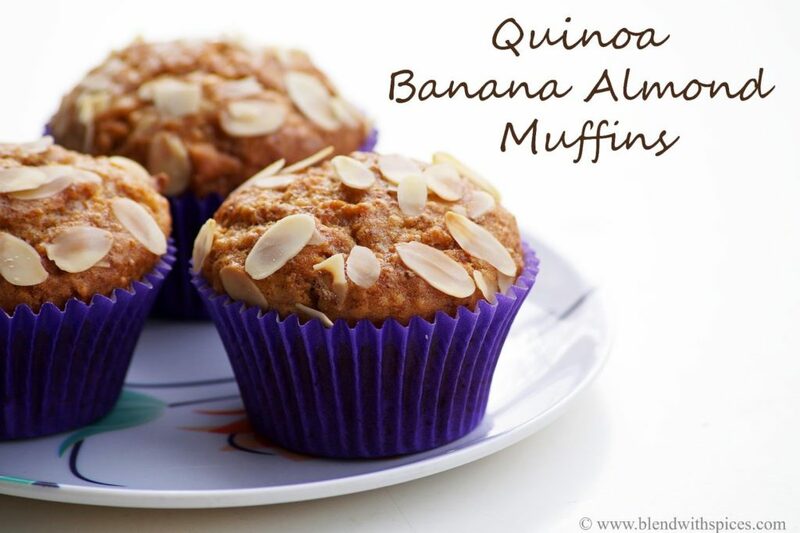 Line a muffin pan or muffin cups with paper liners and set aside. Whisk the flour, salt, baking powder and sugar to ensure even mixing. In a mixing bowl, combine the mashed banana, oil, vanilla essence and milk and mix until well combined. Add flour mixture and cooked quinoa to the milk mixture and mix until just combine. Do not overmix the batter. 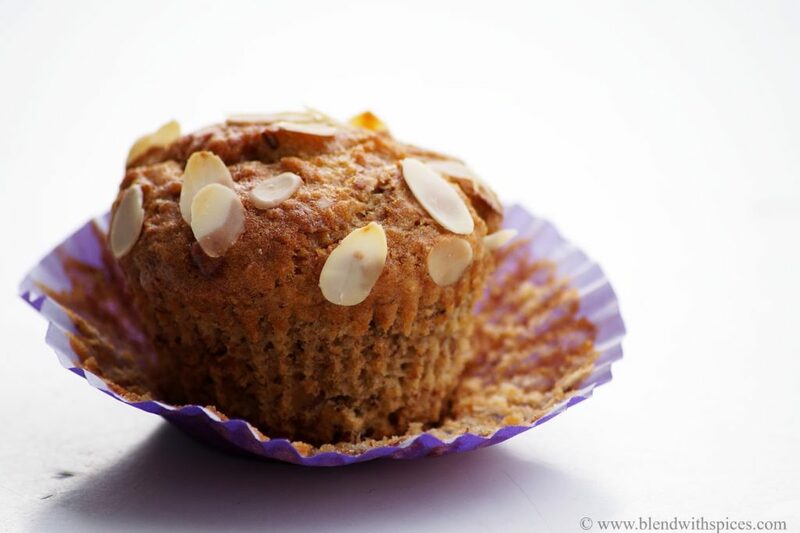 Fill each muffin cup 3/4 full with batter and top with some almond slices. Immediately place them in the preheated oven and bake for 35 – 45 minutes or until toothpick inserted into the center of a muffin comes out clean. The muffins look so fluffy Hari. Just have one query, what to use to replace the banana? and is there any specific reason to use boiled milk?